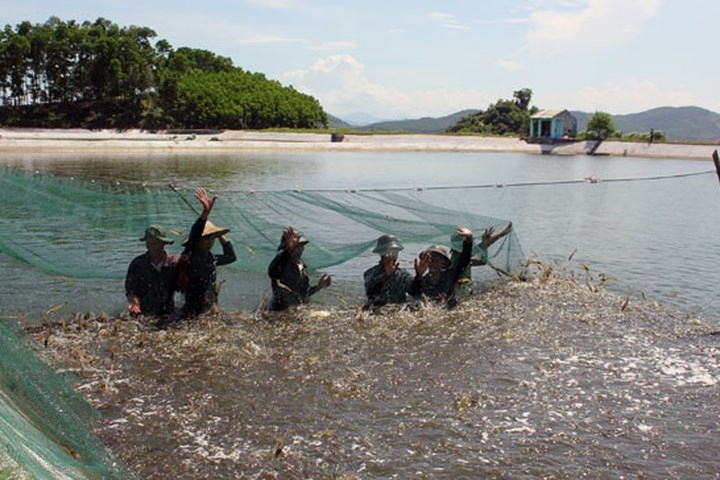 The Mekong Delta province of Tra Vinh is prioritizing calling for investment in 17 projects in aquaculture, mostly shrimp farming in brackish water, with total capital of 1.32 trillion VND (US$54.34 million). Specifically, until 2020, the province hopes to attract 767 billion VND for eight projects, including the building of irrigation systems for aquatic farming in several localities, power and infrastructure system for aquatic farming, a hi-tech shrimp-breeding area in Tra Vinh, and a 100-hectare high-tech shrimp farm in Cau Ngang district. In the 2020-2030 period, the province will prioritise nine other projects on developing irrigation systems for shrimp farming in various communes. Tra Vinh will also encourage businesses to invest in transport infrastructure systems to connect with concentrated shrimp farms in Cau Ngang, Duyen Hai, Tieu Can, Chau Thanh districy, Duyen Hai town and Tra Vinh city, as well as a power supply system for farms in Duyen Hai, Chau Thanh, Tra Cu, Cau Ngang, Tieu Can districts and Tra Vinh city. In order to lure investors, the province will speed up administrative reform to create a favourable investment environment, while setting up an advisory team to support businesses and investors on administrative procedures. Leaders of the province will also increase meetings with enterprises to remove obstacles facing them. Thanks to its 65-km coast line, Tra Vinh has defined brackish shrimp as the major species for growing. Its brackish shrimp farms area is about 24,000 hectares with a total output of about 37,000 tonnes. The province is striving to expand the area to 26,170 hectares with an output of over 70,000 tonnes in 2020, and 28,000 hectares and 103,000 tonnes in 2030, respectively.